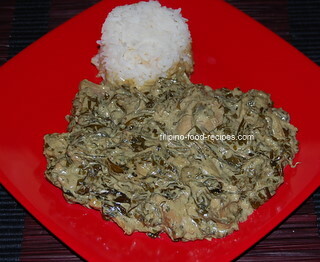 This Laing recipe or Bicol laing is a dish indigenous to the Bicol province. Rich and creamy, it's made from dried taro or gabi leaves and coconut milk. In the Philippines, we would buy fresh gabi leaves, separate the leaves from the stalks and dry the leaves under the sun for a couple of hours before we can use them. Drying takes out the uncomfortable palate texture or kati the taro leaves give when you eat them. The most practical and convenient way to go about this is to buy the packaged dried taro leaves. Available in Asian markets, they're ready to use and just reconstituted with the coconut milk during cooking. 1 Saute the garlic, onion and ginger in cooking oil. Add the pork and cook for 2 minutes. 2 Add the rest of the ingredients and let it simmer for 15 - 20 minutes, stirring from time to time. 3 Cook until the taro leaves have fully absorbed the coconut milk and almost rendering fat. For those who don't like eating a chunk of ginger can just shred it instead of cutting in strips. When buying coconut milk for cooking a savory dish, look for one with 0(zero) sugar content on its Nutrition label. You would not like the hint of sweetness for savory dishes. You can use peeled shrimps with this dish if you want. Add them during the last couple minutes of cooking so it doesn't get rubbery and tough.